The Black Island: Possibly Hergé's homage to Hitchcock and Buchan, this story gets underway when two villainous characters, worried that Tintin may be on their trail, frame him for assault and robbery. 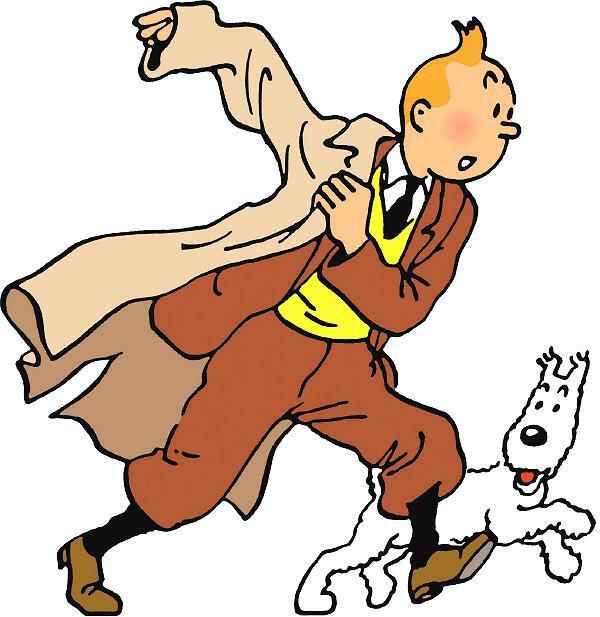 Detectives Thompson and Thomson arrest him, but Tintin knows he's innocent and goes after the real culprits—a gang of forgers led by the sinister Dr Muller. This is a great story set in England and Scotland with beautiful scenery, a well-made detective/adventure plot, and a thrilling climax in a ruined and possibly haunted castle on the Black Island off the Scottish coast. King Ottokar's Sceptre: When Tintin returns a lost briefcase he meets seal collector and sigillographer Professor Alembick, who invites him to travel as his assistant to the fictional Balkan country of Syldavia. At first Tintin isn't interested, but then after a series of brushes with mysterious Syldavians, he realises that something is afoot and joins the Professor for his trip to Syldavia. Tintin soon discovers that there's a plot afoot to force the abdication of the quiet but competent King Muskar XII, but there are traitors everywhere and it won't be so easy to warn the King. This book introduces another notable recurring character—Bianca Castafiore, the buxom and deadly opera star, who will go on to become one of Tintin's most loyal allies. The Land of Black Gold: Trouble is brewing in the Arabian emirate of Wadesdah, the Emir's son Prince Abdullah vanishes, and war seems imminent. Meanwhile, someone is doctoring the world's petrol supplies. Tintin goes to Arabia to investigate. This book is a great adventure story; my favourite parts include the melodramatic story Tintin's ally Senhor Oliveira da Figueira tells the servants at the villain's house to distract them, and the introduction of the ghastly spoiled brat Abdullah. The Red Sea Sharks: Tintin and Captain Haddock find themselves up against an old enemy after they begin investigating a shady arms dealer. Their friend Emir Ben Kalish Ezab has been deposed by archenemy Sheik Bab El Ehr, and the bratty Prince Abdullah has been sent to Captain Haddock at Marlinspike hall for safety. Tintin and Captain Haddock decide that Marlinspike Hall is a little too small to hold them and the Arabian Nightmare, so they jet off for war-torn Wadesdah to see what they can do to help.